My love of luxury beauty oils continues to be unquenchable, and I continuously seem to find what I consider luxurious golden elixirs at all price points. Therefore, I am always thrilled when I am able to introduce you to affordable oils that don't sacrifice lovely textures, scents and efficacy. 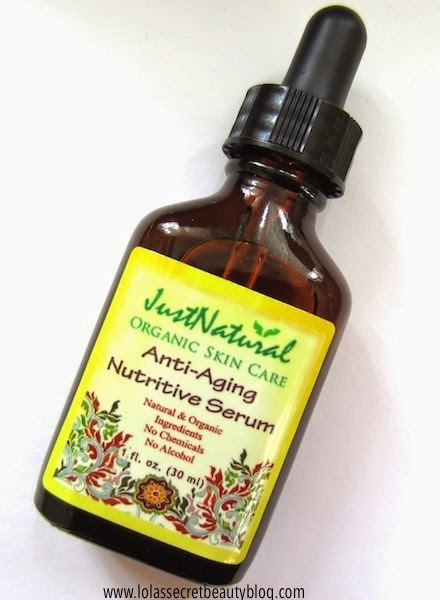 Just Natural Anti-Aging Nutritive Serum is a lightweight and fast absorbing beauty oil that effortlessly nourishes, hydrates and moisturizes the skin. It is filled with beautiful organic oils, of extraordinary quality, that leave skin velvety soft, supple and luminous. Furthermore, it is affordable, has a lovely texture and the bottle is long-lasting. Many serums on the market are made mostly of water (90% +-) with a very tiny amount of active ingredients. This serum has no water, silicone, alcohol or any other filler. Every drop of this serum has powerful vital natural nutrients to help lift and firm your skin from the inside, correcting wrinkles and increasing firmness as this weightless serum is instantly absorbed. Anti-wrinkle ingredients made by nature. 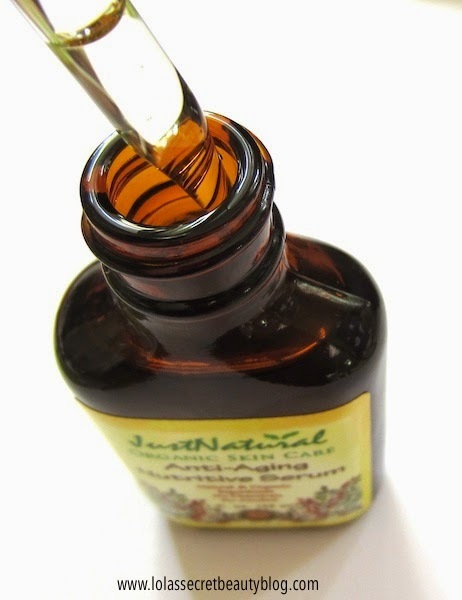 Serum can be used alone or under make-up. Firms and moisturizes for softer, smoother velvety skin. For a more radiant, healthy glow with enhanced skin tone. Gentle, non-irritating formula reduces wrinkles and other signs of aging. Reduce wrinkles and fine lines for a more youthful and healthier appearance. No Mineral Oil, No Petrolatum, No Silicone, No Water, No Alcohol, No Fillers. Erase away the appearance of fine lines, blotches, and discolorations naturally. I warm a couple of drops in my hands and massage it into warm and damp freshly washed skin, and it sinks in immediately. My skin is immediately softened, hydrated and luminous, but with sustained use lines are softened and skin appears more eve in tone. The scent is an intoxicatingly hypnotic warm fruity floral kissed by Frankincense, and it is so pleasant and calming that it does wonders facilitating a good night's sleep. 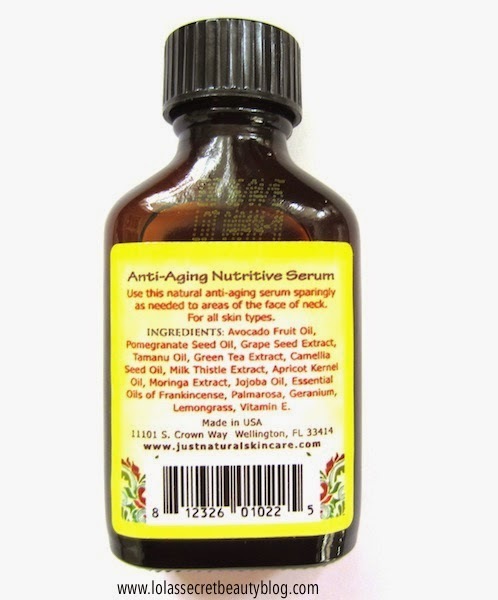 Just Natural Anti-Aging Nutritive Serum is: Alcohol Free, Chemical Free, Cruelty Free, Gluten Free, Handmade Fresh. Made in the USA. Natural & Organic. GMO Free, Paraben Free, Sulfate Free & Vegan. Avocado Oil: "contains essential nutrients like proteins, vitamins A, D, E and B6, magnesium, copper, iron, amino acids, folic acid, as well as potassium known as the youth mineral which nourish your skin. Avocado oil has high levels of plant sterolins are well known for rejuvenating skin and reducing signs of aging." elasticity and works well in anti-wrinkle skin care." 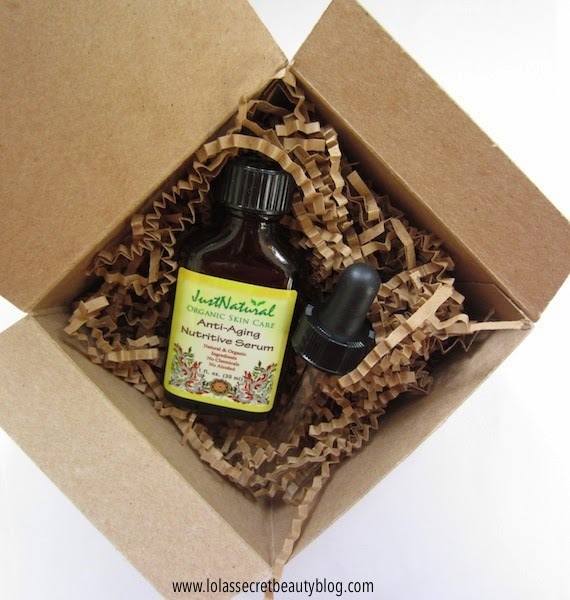 Overall Assessment: A lovely, nourishing, hydrating and affordable face oil. It simultaneously delights the skin and the senses,and gives the skin a lovely ethereal glow. $37.99 from Just Natural Skincare (Unaffiliated Links). Press Sample. All views expressed are categorically my own. Copyright © 2014 www.lolassecretbeautyblog.com All Rights Reserved. It's nice to know that an affordable face oil does exist! I'll look into this brand. This sounds amazing, and the idea of an oil based serum makes so much sense.